This flavourful fish dinner is filled with pizzazz. Cook rice as directed on package. After the first 20 min. of the rice cooking time, combine next 4 ingredients in large nonstick skillet sprayed with cooking spray; cook on medium-high heat 5 min., stirring frequently. Stir cream cheese product and broth into vegetable mixture; cook on medium-low heat 3 min. or until cream cheese is melted and vegetables are evenly coated, stirring frequently. Add fish; cook 5 min. Stir in tomatoes and cilantro; cook 2 min. or until mixture is heated through and fish flakes easily with fork. Spoon rice onto plate; top with fish mixture and coconut. Prepare using cod or your favourite flaky white fish. Looking to add more fish to your diet? This flavourful meal is sure to win over you and your family. 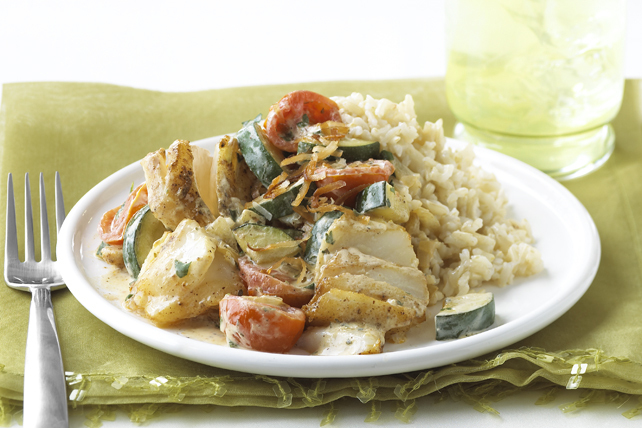 And as a bonus, the zucchini and cherry tomatoes team up to provide an excellent source of vitamin C.